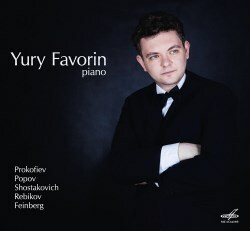 Yuri Favorin explores Russian piano works composed between 1909 and 1927. Instead of focusing on the abrupt political marker of the 1917 revolution, Favorin encourages us to consider a longer period of great cultural and political experimentation, before Soviet arts policy congealed around the concept of socialist realism. This imaginative program invites us to re-evaluate youthful works by two famous composers, Prokofiev and Shostakovich, by placing them alongside exploratory efforts by the lesser-known Popov, Feinberg, and Rebikov. Prokofiev’s Four Etudes, Op. 2 include a lot of fierce and propulsive music. The second piece, a furtive but intense moderato provides moments of delicacy, but the concluding Presto energetico ends with more pounding rhythms. This marvelously furious little work is over in ten minutes. Favorin takes a breakneck pace in Shostakovitch’s First Piano Sonata, written in the same year as his Symphony No. 1. The effect is exhilarating. A much calmer kind of experiment is found in Vladimir Rebikov’s ‘On the Other Side’, dedicated to the memory of Francesco Goya. The first of seven tiny movements is spare, almost proto-minimalist. A quiet, serene chorale follows. The required savage dance seems rather tame, and the remaining pieces continue with a hypnotic cast. Rebikov died in 1920, a bitter and forgotten man who apparently believed that composers such as Debussy and Stravinsky had stolen his best ideas. The great pianist Samuil Feinberg was also a composer. Favorin plays his Sixth and most popular sonata, from 1923. This rather chaotic music is heir to Scriabin, with dynamic extremes, jagged rhythms, harmonic boldness, and a fevered air. The longest and latest work on the disc is Gavriil Popov’s Large Suite, Op. 6, of 1927. Its four movements have a neoclassical tinge, beginning with an invention that is full of poise at one moment, then explodes with passion. The Chorale and Lied continue the neoclassical repose, but the concluding fugue is energetic and intense, a showpiece for the pianist. The piece reminds one of Stravinsky’s 1925 Serenade for piano, except that Popov keeps pushing neoclassicism to admit unexpected elements of passion and virtuosity. This is a heftier neoclassicism than Stravinsky’s, sometimes hinting at pieces Hindemith had yet to write. It has much in common with Popov’s fine Chamber Symphony for Flute, Clarinet, Trumpet, Bassoon, Violin, Cello, and Bass, written in the same year. Favorin’s outstanding pianism allows him to show us how these five composers approached an era of aesthetic uncertainty and relative openness, while retaining their individual voices. This venture deserves praise for being both intellectual and musical. Yuri Favorin is one of six young Russian pianists participating in a comparable recording of the arresting twenty-four Preludes and Fugues by Vsevolod Zaderatsky, which may be one of the greatest unknown works of the mid-twentieth century. This Melodiya recording sounds good, in what was likely a difficult recording assignment, given the tempestuous nature of much of the music. The program notes are not very helpful in helping the listener with five challenging and mostly unfamiliar pieces.